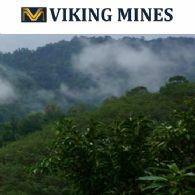 Viking Mines Limited (ASX:VKA) is pleased to advise that it has on 30 June 2017 received USD 1 million dollars in accordance with the Deed between Viking&apos;s subsidiary RAL and BXC Ghana. 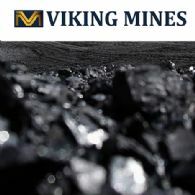 Viking Mines Limited (ASX:VKA), advises that it has issued a formal Notice of Termination to Argo Metals Group Limited and its shareholders that it will not be proceeding with the acquisition of Argo. This acquisition was originally announced on 18 November 2016 however key conditions precedent to the acquisition remain outstanding and Viking no longer considers these as achievable. 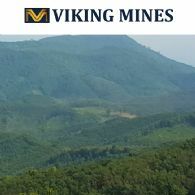 Viking Mines Limited (ASX:VKA) is pleased to advise that it has now entered into a Deed of Acknowledgement with ARL and BXC Ghana that both confirms the original USD10 million sale&apos;s consideration and guarantees the payment of the remaining cash consideration of USD 6.0 million. Viking Mines Limited (ASX:VKA) are pleased to provide the Company&apos;s latest Quarterly Report for the period ended 31 March 2017. The directors present their report on the consolidated entity consisting of Viking Mines Limited (ASX:VKA) and the entities it controlled at the end of, or during, the half year ended 31 December 2016. 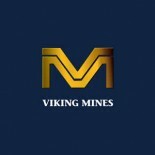 Viking Mines Limited (ASX:VKA) (Viking or the Company) is pleased to provide its shareholders with the following link to a recent interview between Paul Lock, Managing Director of Argo Metals Group Limited (Argo) and Director elect of Viking, and Board Room Media&apos;s CEO, Mr Will Canty. 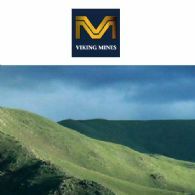 Viking Mines Limited (ASX:VKA) is pleased to provide its shareholders with the following link to a recent interview between Paul Lock, Managing Director of Argo Metals Group Limited (Argo) and Director elect of Viking, and Board Room Media&apos;s CEO, Mr Will Canty. Viking Mines Limited (ASX:VKA) (Viking or the Company) wishes to provide the update on exploration at the Reung Kiet Lithium Project, and in particular the Bang I Tum Lithium Prospect, in Southern Thailand. 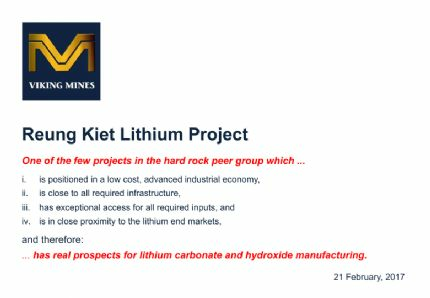 Viking Mines Limited (ASX:VKA) is pleased to provide the Company&apos;s latest Presentation on Reung Kiet Lithium Project.